These are days of war talk, and the same sort of talk is coming out of Israel and the United States. From Israel's Prime Minister, Ariel Sharon: "Israel will not surrender to blackmail. He who rises up to kill us, we will pre-empt it and kill him first. As we have proven there is no and there will never be any shelter for evil." From US President George W Bush: "We will not wait to see what terrorists or terrorist states could do with weapons of mass destruction. We are determined to confront threats wherever they arise and as a last resort we must be willing to use military force." It is the language of war against terrorism, used for both Iraq and for the Palestinians. But are the two conflicts the same? "The Americans and the Iraqis don't have a dispute about land, they don't have a political dispute about sharing the same area," says Israeli defence correspondent Alex Fishman. "In Israel, we've got an historical, cultural dispute, it's a completely different story, you can't compare it." So if the conflicts are different, why is the language the same? Suicide bombings have certainly contributed. They have reinforced Ariel Sharon's view that Palestinian violence is terrorism rather than a national struggle against occupation. And, says analyst Akiva Eldar, they have also suited his political agenda. "The suicide bombings is something that made it even easier for Sharon to sell this equation that we and you the Americans are in the same boat," he says. "Because 11 September was a suicide bombing. Both in the US and in Israel it helped people to paint the conflict in black and white." But it is more than the way the US and Israel describe their conflicts; they also talk about the same solutions. 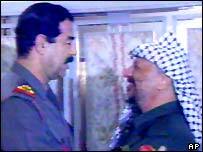 Regime change, for instance, is viewed by many as good not only for the Iraqi President Saddam Hussein, but also for the Palestinian Leader Yasser Arafat. "In the case of Arafat it's been clear for the vast majority of Israelis for probably close to three years now that we will get nowhere with him," says former Israeli Defence Minister Moshe Arens, "that there has to be regime change there if we're going to arrive at useful negotiations." Then there is military occupation - of the West Bank right now, but maybe soon of Baghdad. And pre-emptive strikes - long an Israeli policy - have become part of the US lexicon. Israeli counter terrorism expert Boaz Ganor witnessed the transition in American thinking while he was there on a lecture tour that coincided with 9/11. "Of course I had been asked difficult questions, like how dare Israel use targeted killings, they called it assassinations," he says. "After 9/11 this question was not asked even once. "Because the same day of 9/11 President Bush said we are going to hunt them, and what is hunting them if not targeted killings?" So does this mean Israel is directly influencing Washington's strategy for its war against terrorism? "I think we in Israel have to be more modest than that," says Moshe Arens. "I think the United States has shown itself to be quite creative in the fighting in Afghanistan, I don't think they needed to learn anything from us." But some think Ariel Sharon may have shown what it is possible to get away with. "I am sure that Bush looks at Sharon and says to himself: listen, this is a tough guy, look what he is doing there, he is succeeding, the Israelis like it, the international community is not really too upset about this," says Akiva Eldar. "So perhaps this is the message to the Americans, that it works." What about after the war? How would an American victory affect the Israeli Palestinian conflict? Some say it would facilitate a solution, others that it would complicate matters. What seems clear now is that Israel and the US increasingly have the same approach to dealing with conflict: one based on force and deterrence, rather than diplomacy and international law. And here Akiva Eldar thinks there is a direct connection. He says key policy advisors around George Bush do see America's battle with Iraq and Israel's battle with the Palestinians as part of the same war. "They have actually suggested that Israel will help the United States to take over the Middle East," he says. "They were sitting in think tanks that believed that you don't even try to appease or satisfy the Arabs, you reach peace by force which means you impose it... you don't make concessions to people you don't trust, and that puts them and Sharon in the same party." That is a controversial view, one which few Israelis or Americans would accept. But it is one which may be strengthened by a US strike against Iraq, at least in the eyes of Arabs and Muslims.